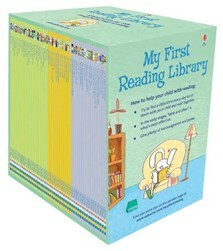 A box set of 50 paperback editions from the award-winning Usborne Very First Reading and First Reading series to inspire your child as he or she learns to read. The first 22 Very First Reading titles let your child, with your help, take the first steps in reading, following the phonics methods used in schools. The next 12 books are delightful short stories for children to try reading themselves, taken from the Usborne First Reading series Level One. 16 further books with slightly longer stories from the Usborne First Reading series Level Two will build stamina and reading confidence. Click on Extras to see all titles in this box set. We love this set. I bought this set after watching some reviews on youtube and I liked the idea of reading together. It stimulates kids' curiosities and confidence to continue. I bought this set for my son when he was 2.5 yrs old. He already knew to read some words at the time, but he likes (still does) the books so much that he was keen on tackling all the books in 3 months. And now he can read all by himself. But he still prefers to read together so i can translate to other languages as well. Now at the age of 3, I decided to get him the the second set and very much looking forward. I recommend this set over other publishers' that I have purchased as the contents are very attractive to kids! We have been delighted to start through these, our oldest kids were taught (and struggled..) with Oxford learning tree (Biff Chip and Kipper), these books will delight the kids with their illustrations and their rhyming helps little ones grasp where each page is going. Not got through half of this yet but my 4y old brings me several a day for us to sit and enjoy in a leisurely fashion. It is lovely to see him learning without having to 'try' .. other series we have found a chore! !